According to the US Treasury Department, Japan has regained its spot as the planet's largest foreign holders of US treasury debt. The Chinese government had held this spot for the past 17 months or so, eventually relinquishing it after trimming over $34 billion in long and short-term Treasury debt in December. Japan, on the other hand, added $11.5 billion, propelling them into the top spot once again. 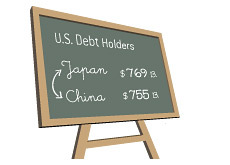 As of December, the Japanese owned approximately $769 billion in US Treasury debt, while the Chinese owned approximately $755 billion. China owned a little over $800 billion in US Treasury holdings in May of 2009. As the WSJ points out, the decline in China's US debt holdings is mostly due to them deciding to offload some of their shorter-dated Treasury bills that were purchased during the financial crisis. China, as the paper points out, is still a net buyer of longer-dated Treasury debt (+$4.6 billion in December). Japan's reign at the top may be a short one due to the troubles in the European Union. Many believe that the Chinese will seek the relative comfort of US Treasuries due to the blossoming crisis in the EU, which will likely result in China regaining the top spot once again from Japan. There are only so many places that China can park its money, and if the situation in the European Union continues to worsen, then I would expect that these Chinese will pile back into US Treasuries, at least until the situation with the EU starts to stabilize somewhat. The US Treasury department reported that foreign demand for U.S. Treasury securities fell by the largest amount on record in December, dropping by an estimated $53 billion. Most of this drop was due to China, who, as mentioned, cut their holdings by about $34 billion. Slackening foreign demand for their debt offerings is obviously a concern for the United States, who will have to heavily rely on foreign purchases to finance their eye-popping deficits over the next decade. If demand continues to drop, then interest rates will have to move higher, which is about the last thing that the United States wants right now.